438 pages | 6 B/W Illus. This handbook examines the regional and international dynamics of the Middle East. It challenges the state society dichotomy to make sense of decision-making and behavior by ruling regimes. The 33 chapter authors include the world’s leading scholars of the Middle East and International Relations (IR) in order to make sense of the region. This synthesis of area studies expertise and IR theory provides a unique and rigorous account of the region’s current dynamics, which have reached a crisis point since the beginning of the Arab Spring. The Middle East has been characterized by volatility for more than a century. Although the region attracts significant scholarly interest, IR theory has rarely been used as a tool to understand events. The constructivist approach in IR highlights the significance of state identity, shaped by history and culture, in making sense of international relations. The authors of this volume consider how IR theory can elucidate the patterns and principles that shape the region, in order to provide a rigorous account of the contemporary challenges of the Middle East. 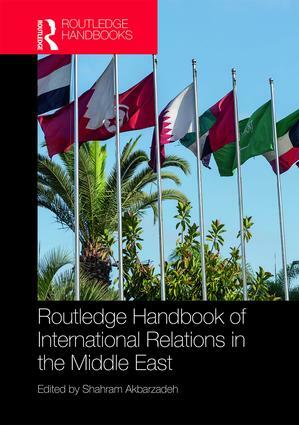 The Routledge Handbook of International Relations in the Middle East provides comprehensive coverage of International Relations issues in the region. Thus, it offers key resources for researchers and students interested in International Relations and the Middle East. Shahram Akbarzadeh is Research Professor in Middle East and Central Asian Politics at Deakin University and the Deputy Director (International) of the Alfred Deakin Institute for Citizenship and Globalisation, Deakin University (Australia). He held a prestigious ARC Future Fellowship (2012–2016) on the Role of Islam in Iran’s Foreign Policy-making and recently completed a Qatar Foundation grant on Sectarianism in the Middle East.